The Cannon Beach Conference Center updated its Master Site Plan several years ago. In June 2009, construction was completed on the Ecola dorm providing office space for Ecola Bible College and dormitory housing for students and CBCC summer staff. The Kitchen & Dining Complex is the current major project in CBCC’s Master Site Plan. It was determined during the master planning process that the dining room is not only the oldest building on campus, it’s too small and has an inadequate kitchen. In 2011 we began the design phase. We decided to move slowly, working on grounds beautification and interior renovation projects, as the US economy strengthened. Spring of 2014 we were ready to take the next step. Preliminary architectural drawings were completed, construction estimates were gathered, and the initial fundraising for the Kitchen & Dining Complex began. The modernizing of the kitchen and dining room fits well within CBCC’s mission statement. Meals are central to providing guests relaxation and spiritual renewal in our beautiful setting. We often say, “The kitchen and dining room are where meals and memories are made.” CBCC’s vision and practice has been to carefully lay projects before the Lord, then move forward as donors pray and support the project financially. It has been necessary following new construction to spend time catching up on facilities maintenance projects. In 2009, we launched the Grounds Beautification project and in 2010 we began a far-reaching Interior Renovation project. These projects are now successfully completed, letting us concentrate for the next few years on new construction. Master planning discussions place the new building near the existing main dining room and kitchen. A webcam points to the area of initial construction in an area guests know as the horseshoe pits just south of the main entrance, along Spruce Street. Construction began the end of 2016, mostly underground work that by the end of 2017 showed a complete slab for the first building phase. As we look forward to Phase One being finished for 2019 summer conferences, the building’s exterior should be complete by late fall. Completing the kitchen and interior work will keep our subcontractors, staff and volunteers busy through the winter and spring. Construction will parallel serving guests. The new kitchen, and part of the new dining room are being completed without demolishing the existing main dining room. We are confident that as new construction is phased in, existing facilities will be adequate for temporary use with minimal inconvenience to conferences and retreats. For sure, the work areas will be busy and provide an exciting display of God’s work among his followers. Our kitchen prepares more than 400,000 meals per year and services three dining rooms. The limitations of our existing kitchen facilities make it challenging to produce the quantity of meals we serve at the quality our guests have come to expect. The food preparation, cooking, bakery, storage and serving areas will be enlarged to provide adequate room and modern equipment. The dish washing, loading dock and recycle areas will be expanded and given easy street access. Modern dining rooms have higher ceilings, fewer obstacles and accommodate current audio visual technology. The existing dining room was built in 1948 with pieces added or enclosed over the years. Since Pacific View Lodge was constructed and Ecola Creek Lodge motel was purchased, no additional seating has been added to the main dining room. Our main dining room needs to be larger. And it needs to be designed with multi-use features in mind. The Office and Dormitory Building (Ecola Dorm) cost $1.6 million in 2009. 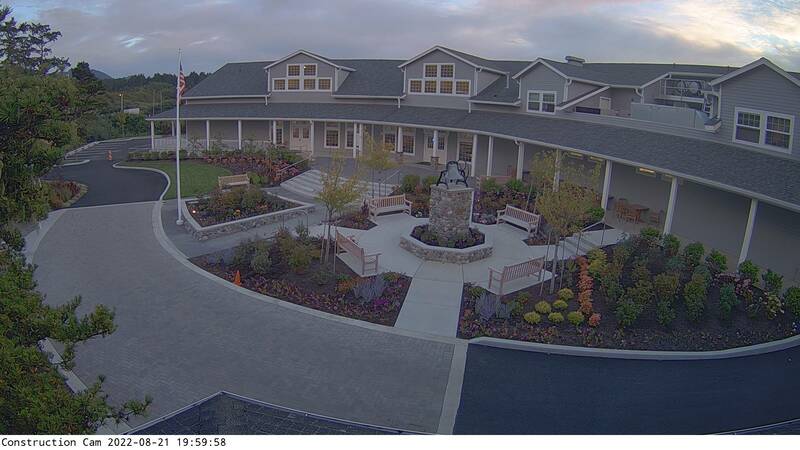 The Family Recreation Center required $2.4 million by the time landscaping was finished. It is estimated the Kitchen & Dining Complex, with its size and complexity, will cost at least $4.2 million to complete. Yes, we have a Kitchen & Dining Complex designated fund receiving cash, credit card, online, or securities donations. We also encourage 1 or 2 year pledges. In-kind gifts of materials, equipment, and specialty labor are always appreciated. Watch the construction progress on our webcam accessed here on our website or with the CBCC mobile app.